UPDATE: A Port Authority spokesman told CBS News around 5:30 p.m. ET that AirTrain service was restored and back at full service. Bus service was continuing due to high holiday demand. 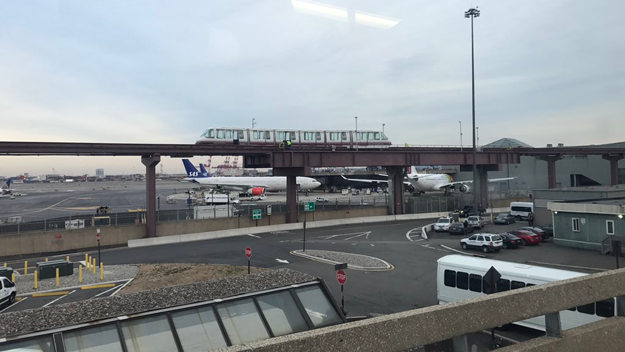 NEWARK, N.J. -- Newark Liberty International Airport’s AirTrain lost power Friday, leading to long lines on what is already one of the busiest travel days of the year, CBS New York reports. The monorail that connects the airport’s terminals with parking lots and a New Jersey Transit rail station was out of service Friday afternoon due to equipment problems. Port Authority officials said the AirTrain stalled between Terminals B and C around 3:15 p.m.
About 45 minutes later, officials said passengers aboard the AirTrain were evacuated without incident. Shuttle buses were being brought in to use in its place. The AirTrain started operation 20 years ago. Last year, the Port Authority of New York and New Jersey, which operates the AirTrain and the airport, announced that the system needs to be replaced and won’t be safe for passengers to ride by 2022. There have been some other travel hiccups in the busy holiday season already: Icy conditions caused a Spirit Airlines plane to slide off the taxiway at Niagara International Airport near Buffalo on Sunday, and a United jet skidded off the runway at Chicago’s O’Hare International Airport.